Here is a box of babies. 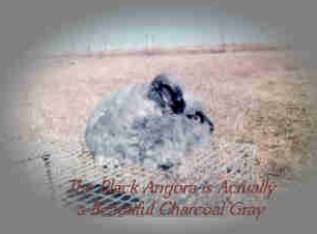 As you can see there are often multiple colors in one kindling. This is Lola. 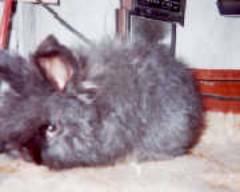 She was a wild-gray agouti doe out of Graben, a fawn buck from my friend Lil. This is a black buck, Rainier. This picture is not when the wool is at its full length. 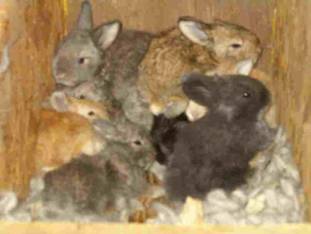 This is one of a kindling of 8 black bunnies. This is when they were about 6 weeks old and soooo cute. 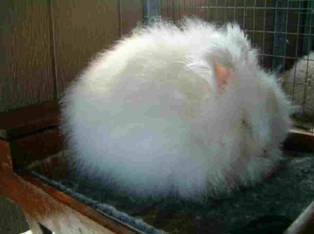 This is a red-eyed white English Angora. 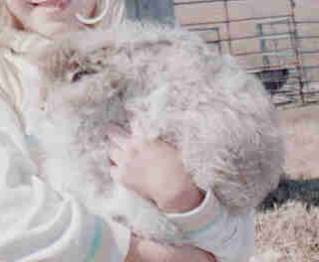 He was a great asset to my bunny herd.